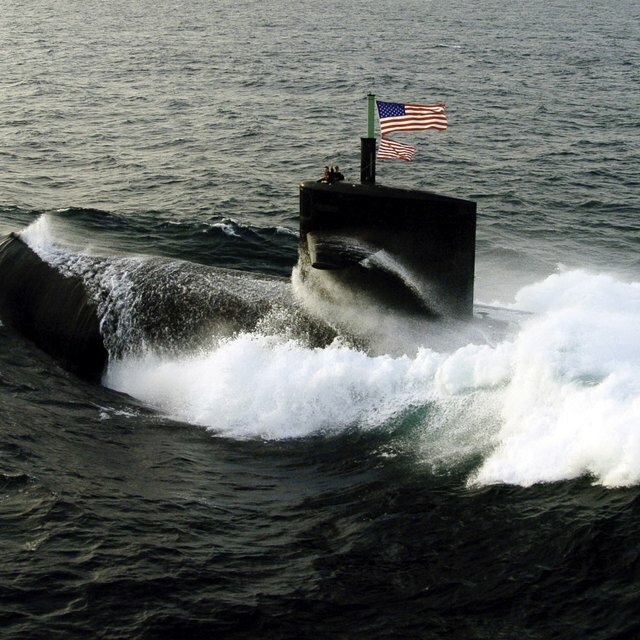 U.S. military personnel are permitted to wear commercial or military-issue wristwatches that meet military performance specifications. 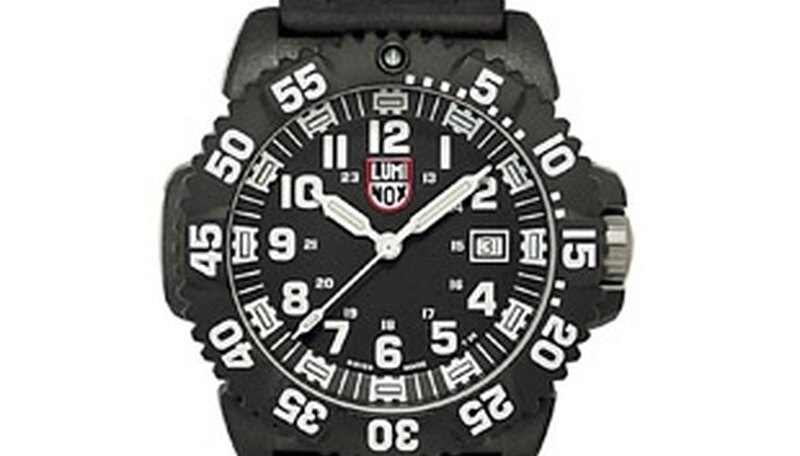 Most watchmakers today sell inexpensive military-style watches that meet the requirements. Among the watchmakers are Hamilton, Seiko and the Marathon Watch Company. Most mechanical and quartz watches feature clock hands instead of digital display for easier nighttime reading. Before World War I, wristwatches were regarded as ladies' watches. 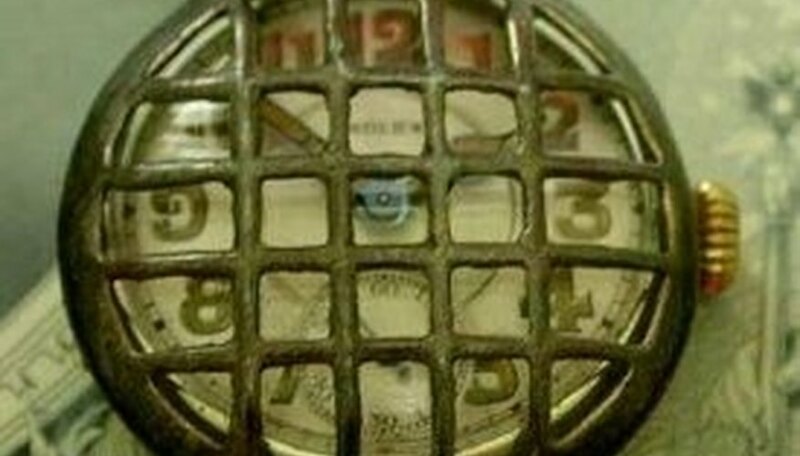 But trench warfare made the wristwatch more practical in tactical operations. 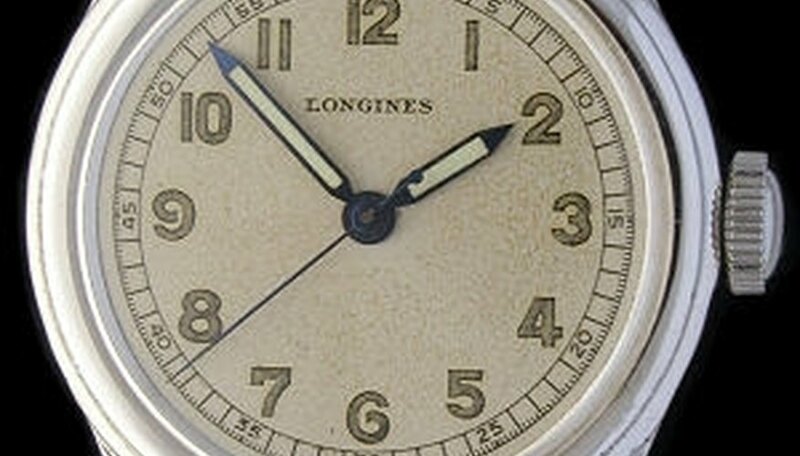 Rolex and other leading watchmakers supplied military personnel with durable, accurate timepieces with large Arabic numerals, illuminated hands and a metal grille over the dial for protection. Later models featured illuminated hands against a black dial for easier reading in total darkness, according to boingboing.com and streetdirectory.com. The U.S. military has no specific requirements for the appearance and construction of a wristwatch to be used for military purposes. However, it has established specific standards for watch performance. By developing performance standards, the military has opened the door for the use of commercial watches, according to olive-drab.com. Military specifications, effective beginning in 1989, require that tritium vials as an illumination source replace tritium luminous paint. 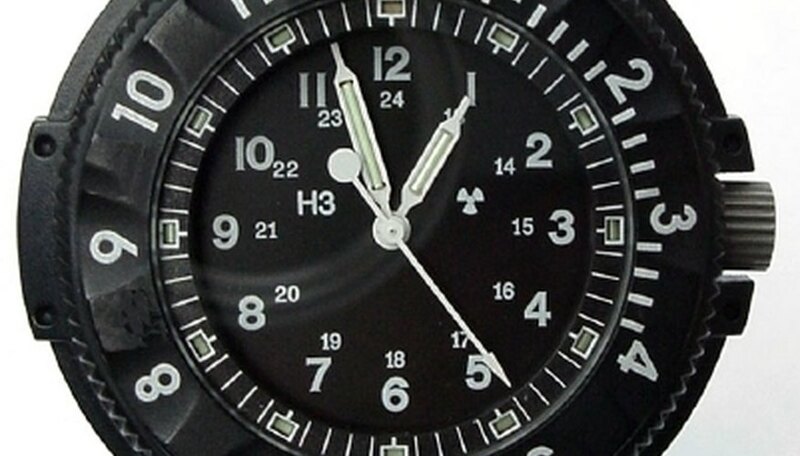 The dial and hands were updated to reflect this change, along with the requirement that the H3 radioactivity symbol be displayed, according to olive-drab.com. 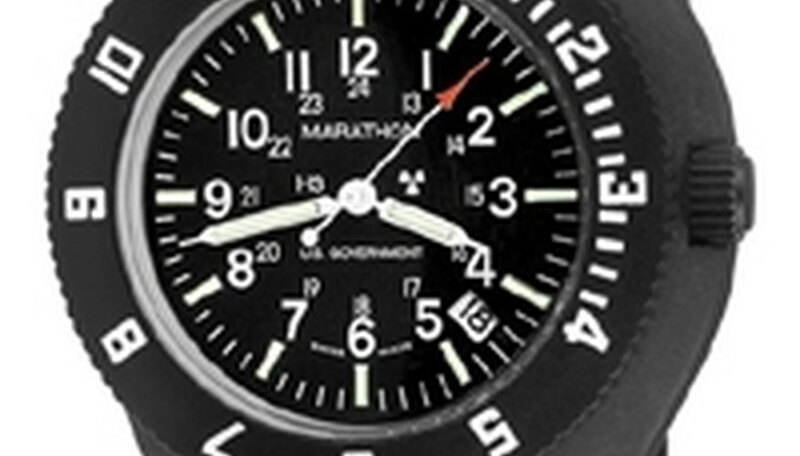 Military-use watchmakers, such as Stocker & Yale and the Marathon Watch Company, produce inexpensive wristwatches that meet military specifications. Stocker & Yale's mechanical Sandy P650 Type 6 Navigator watch, for example, is issued to U.S. Army and Navy personnel, including Ranger, SEAL and Special Forces units. The Sandy P650 measures 46 mm long, 45 mm wide and 10 mm thick. It features a black nylon band. It's shock- and water-resistant. Its works and dial are contained in a non-reflecting black nylon alloy case, according to olive-drab.com and Hyunsuk's U.S. Military Watches. 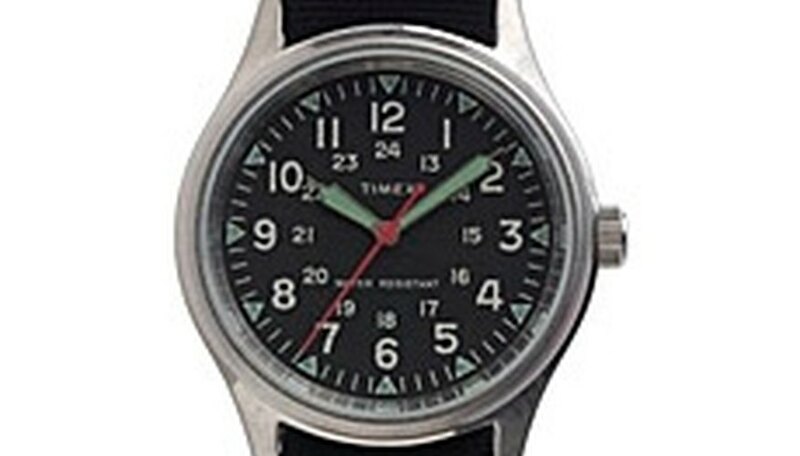 Military watches are not expensive and can be sold to military personnel or civilians for as little as $50. Watch manufacturers emphasize durability, but recognize the extreme conditions watches endure and build them essentially as disposable timepieces. A mechanical watch needs to be wound daily and is very reliable, but quartz models are more accurate in the long run. Some quartz models have cases that can't be opened and are discarded when the battery dies, according to olive-drab.com and marathonwatch.com. Cammenga, Stocker & Yale, Marathon Watch Company and other watchmakers produce military watches in limited styles, although Marathon Watch at present is the only official military-issue watchmaker. 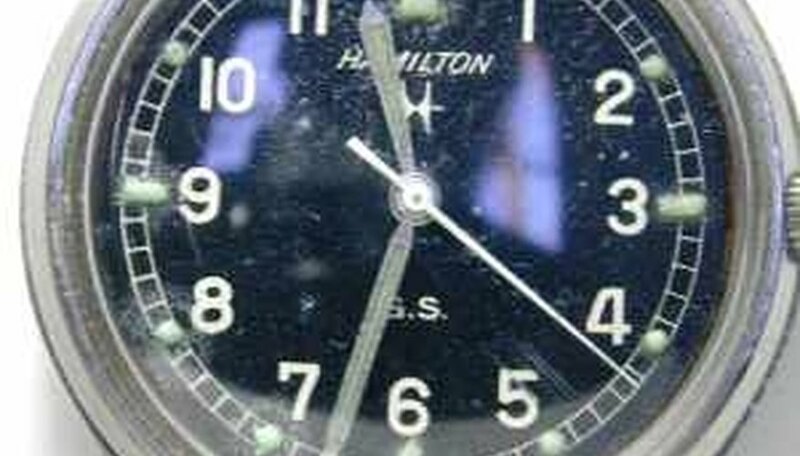 During World War II, Bulova and Hamilton produced large quantities of military watches. During the Vietnam War, Hamilton was perhaps the most popular among military personal, according to olive-drab.com. U.S. troops in Iraq and Afghanistan freely alternate between owning commercial or military-issued watches. But commercial watches that don't meet military specifications can't be purchased with allowance pay unless approved by the unit commander. In addition, commercial watches that fail to meet guidelines can't be used for tactical operations, according to olive-drab.com.